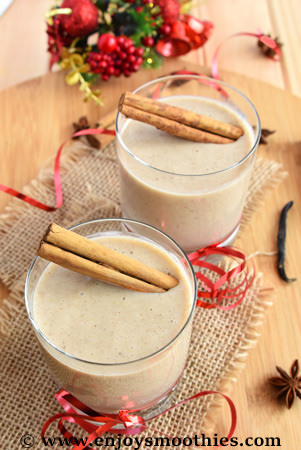 Ditch the morning caffeine and enjoy a banana cinnamon smoothie instead. This is breakfast and coffee all rolled into one, combining all the favors of a chai latte with the health benefits of bananas. Cinnamon has a delicate, sweet and subtle aroma that pairs wonderfully with other spices, such as ginger, cloves nutmeg and cardamom. Think of all those wonderful holiday spices that you use to make your gingerbread and other goodies. 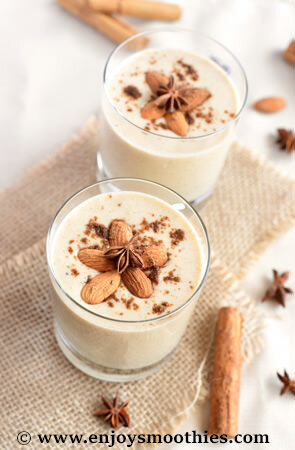 In fact this makes a great holiday smoothie to enjoy over the festive season. Adding bananas makes your smoothie extra creamy, while also complementing the sweet flavor of this wonderful spice. Cinnamon comes from the bark of an evergreen tree belonging to the Lauraceae family or laurel. A tropical plant, it is native to Sri Lanka, but is also grown in other South East Asian countries. Modern research is confirming what alternative medicine practitioners have known for centuries, spices such as cinnamon aren’t merely flavorsome, they’re healthy too. Cinnamon stimulates the vital functions of the body, counteracts congestion, aids circulation, eases nausea and may be useful in the treatment of osteoarthritis and type 2 diabetes. Adding a pinch to your smoothies may help reduce cholesterol levels and calm the stomach. 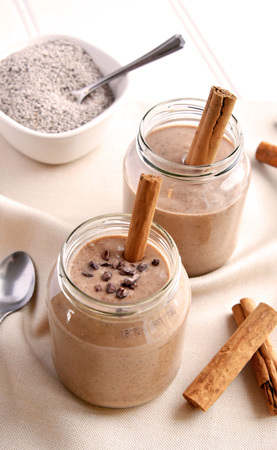 Add between ½ to 1 teaspoon of ground cinnamon to your blender. Vanilla extract and cinnamon are classic sweeteners and when combined together give exactly the same sweetness as sugar, but without the calories. Add the bananas, almond milk, vanilla yogurt, almond butter, vanilla extract and cinnamon to your blender and blend on high until everything is smooth and creamy. Blend together the bananas, almond butter, almond milk, chai spice mix and Medjool dates until your smoothie is frothy and creamy. Pour into two your favorite glasses or jars and enjoy. Add all ingredients to your blender and mix together until you have a cool, creamy smoothie. This may seem like an unusual combination, but trust me, this is delicious! Combine the bananas, almond milk, peanut butter and chai spice mix in a blender then blend together on high until smooth and creamy.